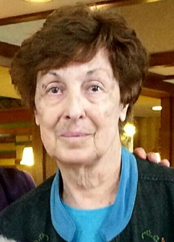 Geraldine H. “Geri” Palm (nee Kuduk), age 77 of Otsego, MN, formerly of Hawkins, WI, passed away on Thursday, June 29, 2017 at North Memorial Medical Center in Robbinsdale, MN. Geraldine was born March 13, 1940 in Ladysmith, WI to William “Willy” and Helen (nee Brzenski) Kuduk. She grew up on her parents’ dairy farm in Hawkins, WI along with her twin brother, Gerald “Jerry” and younger brother, Carl. She attended school in Glen Flora, WI. In her early years, Geraldine played volleyball and bowled with her friends from work, and she enjoyed going dancing at the Bel Rae Ballroom. She enjoyed reading books and magazines, decorating her home, crafting, and going out to eat while enjoying conversation over a cup of coffee. Geraldine was a kind, loving, forgiving, and very thoughtful person. She always made sure birthday cards were sent out, letting that person know she was thinking about them. She was a peaceable woman, who wanted that for everyone else too, regardless of the situation. Geraldine was preceded in death by her parents; and a grandson, Kyle Adams. She is survived by her loving husband of 41 years, Dwaine Palm; children, Gwyn Simpson (Scott), Pam Adams (Tony), Cindy Hemken (Scott), and Scott Palm; grandchildren, Eric, Nicholas, Noah, Savannah, Miah, Daniel, James, Travis, and Trent; great-grandson, Mason; twin brother, Gerald “Jerry” Kuduk (Henrietta); and younger brother, Carl Kuduk; also survived by many nieces, nephews, relatives, and friends. Funeral Prayer Service Thursday, July 6, 2017 at 11:00 a.m.